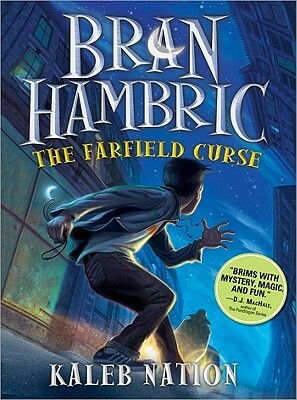 The Farfield Curse brims with mystery, magic, and fun. Kaleb Nation's wry sense of humor kept me smiling, even while the mystical sparks flew. I also have my own YouTube channel (youtube.com/kalebnation) where I create video blogs and content for about 22,000 subscribers. I also enjoy making music with my computer, mainly instrumental and soundtrack scores. I have composed a soundtrack for the novel (you can hear many of the tracks at http: //www.kalebnation.com/music). This has received a lot of attention, with over 20,000 plays on YouTube. I have plans to offer the soundtrack for free download to promote the novel. KN: Bran Hambric was found locked in a bank vault at six years old, with no memory of his past. For years, he has lived with one of the bankers, wondering why he was left behind--until one night, when he is fourteen, he is suddenly confronted by a maddened creature, speaking of Bran's true past and trying to kidnap him. Bran finds that he is at the center of a plot that started years before he was even born: the plot of a deadly curse his mother created...and one that her former masters are hunting for him to complete. Haunted by the spirit of his mother's master and living in a city where magic is illegal, Bran must undo the crimes of his past, before it is too late. KN: The first novel took most of my teenage years to complete--about six years.